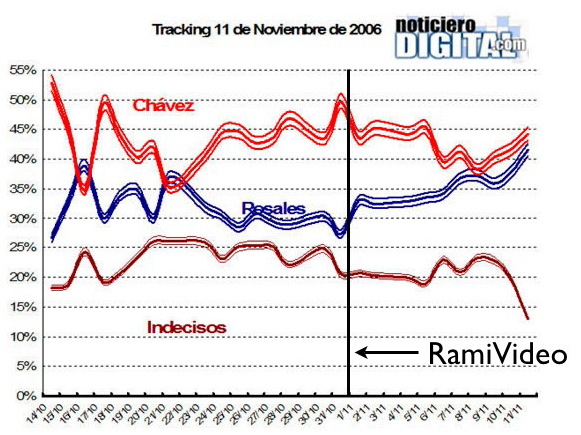 Quico says: Well, thanks to the Hinterlaces/Noticiero Digital tracking poll, we finally have a consistent methodology time-series on how the campaign is going. That’s good. What’s bad is that they’re polling over the phone, which makes class-stratification tricky and probably undercounts Chavez supporters. Does that make the poll useless? Not at all. A poll is a tool, and it’s important to know what any tool is good for. For the same reason you wouldn’t use a screwdriver to hammer in a nail, you shouldn’t use the Hinterlaces/ND tracking poll to figure out a candidate’s support level. What a tracking poll does tell you is something about trends. The direction of change is more meaningful than the absolute values here. Because they’re polling a sample of just 500 each night, the individual data points are “noisy” – there’s certainly a lot of random variation, and it’s not wise to draw conclusions from overnight shifts. But if you look at longer periods – a week, even – you can see trends emerging, and those give you a pretty good sense of the dynamics of the race. 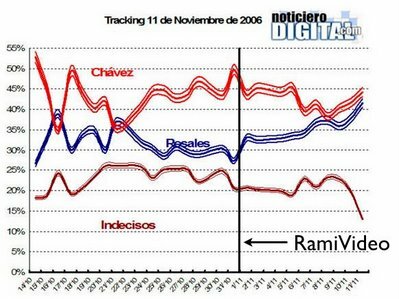 And one thing that’s clear looking at this chart is that the publication of Rafael Ramirez’s roja-rojita PDVSA speech put some wind in the sails of the Rosales campaign.